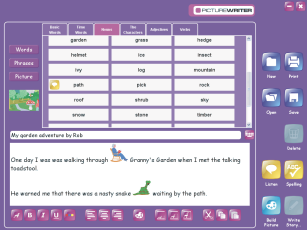 Picture Writer Granny's Garden has been developed in conjunction with JVSoft with the specific aim of developing literacy skills especially writing. 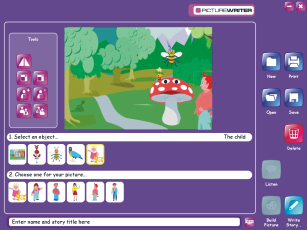 The software allows users to build scenes based on Granny's Garden through the use and manipulation of picture stamps. You don't have to be a great artist to produce great pictures. 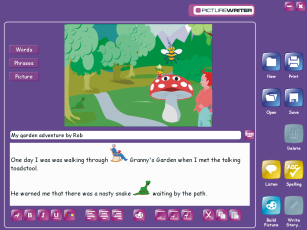 These scenes act as stimuli for the development of writing skills. Write about the use of the adventure or create your own story - the possibilities are endless. You can even export your pictures for use in podcasts. We are currently running a special offer on site licences. You can purchase a site licence for only £69.00† instead of the normal price of £138.00† saving you £69.00.